A little history . . .
It’s the most misused technological innovation since the handgun. It’s a major reason why business leaders give less effective speeches and presentations today than they did just a few years ago. It’s PowerPoint – and it now ruins more presentations than it helps. Pouring more gasoline onto the fire? The promise . 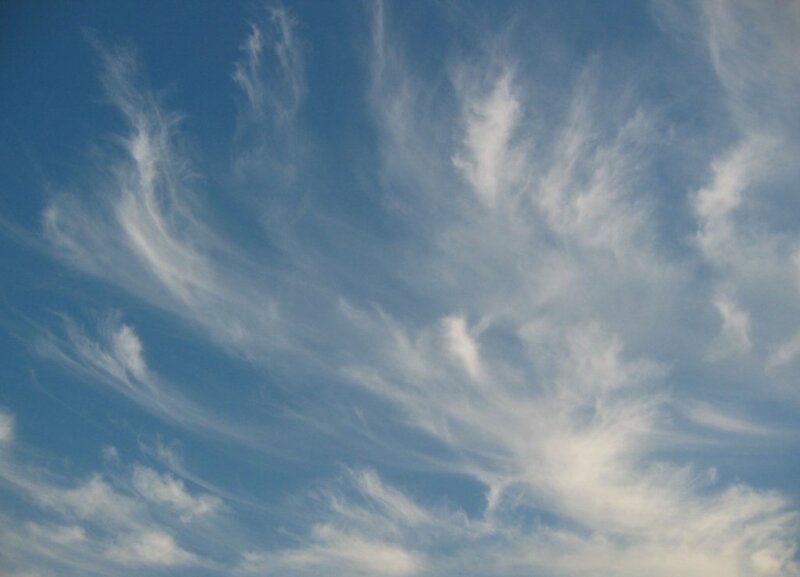 . .
Record and share the audio as well! Each slide marked up in a div element with class="slide"
These can be marked up using CSS relative positioning, e.g. Just add class="outline" to the ul or ol element. Click on this list item for more details. The Slidy script will then treat the list as an outline list. Clicking on outline list items will expand/collapse block-level elements within that list item. Click on the above to make this list item collapse again. Users will then see expand/collapse icons as appropriate and may click anywhere on the list item to change its state. This particular list item can't be expanded or collapsed. Add class="expand" to any li elements that you want to start in an expanded state. By default Slidy hides all the block level elements within the outline list items unless you have specified class="expand". Such pre-expanded items can be collapsed by clicking on them. 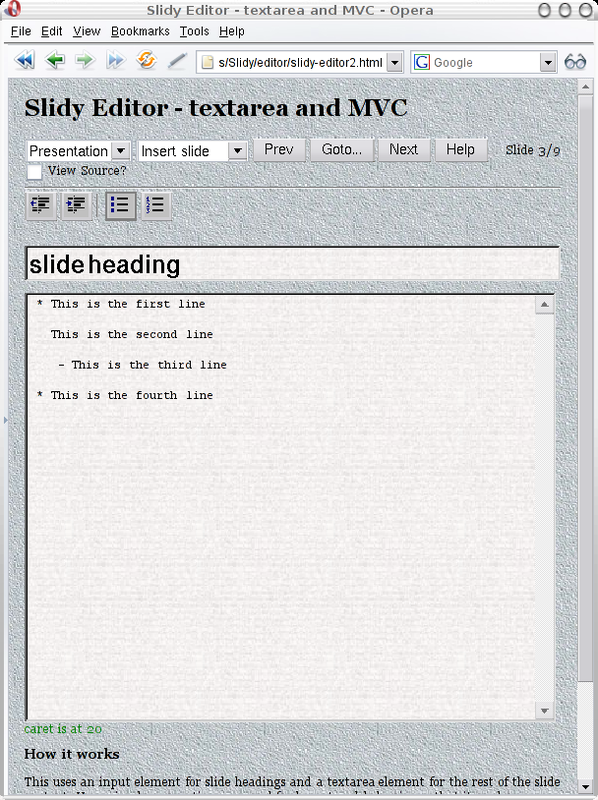 Slidy shows matching backgrounds as well as backgrounds with class="background"
This slide combines a specific background (W3C logo) with the presentation background (notebook). This ensures that the enclosed png is displayed when the browser has no plugin installed or can't display SVG directly. However, there are caveats, see the next slide! As a result relative references from within the SVG to external resources (scripts, CSS, images, other SVG) will break. The work around is to use absolute references within your SVG. This problem doesn't effect Mozilla/Firefox. No idea as to whether it will be fixed in IE7. On Windows, the Adobe SVG plugin doesn't respect the CSS z-index property, and if used on backgrounds will always show through other content. Most browsers only support SVG Tiny, which doesn't support external style sheets or style elements within SVG. Are there any tools for downgrading SVG to SVG Tiny? Optional copyright statement set via meta element, e.g. Will probably drop this feature in favor of edit link! Incremental display, Contents, Handout notes, etc. 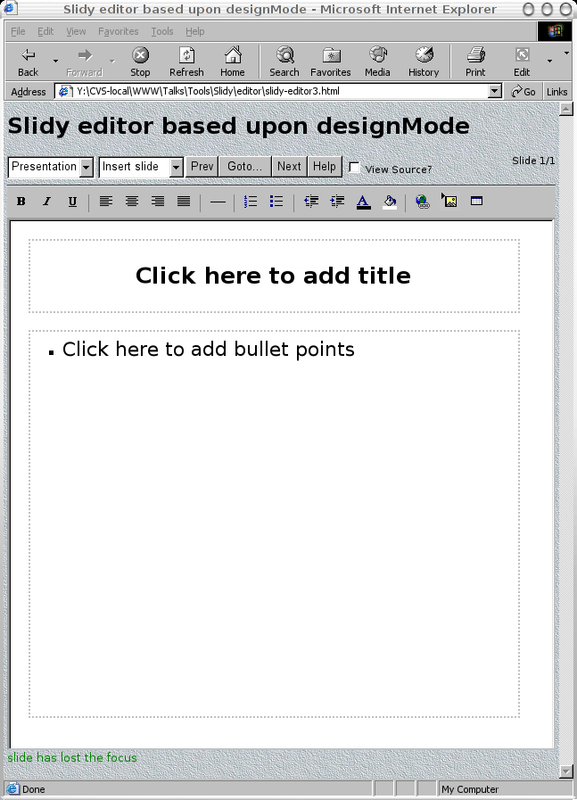 Image toolbar pop-up and galleryimg="no"
Slide templates for title slides, bullet point slides, etc. But was the line wrapped by the browser or did you press the Enter key without realizing? Could we override the behavior of the textarea element to provide a rough approximation to what you see is what you get? The solution is to implement the model-view-controller design pattern and completely override the browser's built-in behaviour! If anyone from Microsoft's IE team is present, please please please make this easier! Will Safari, Opera and other browsers support this behaviour? 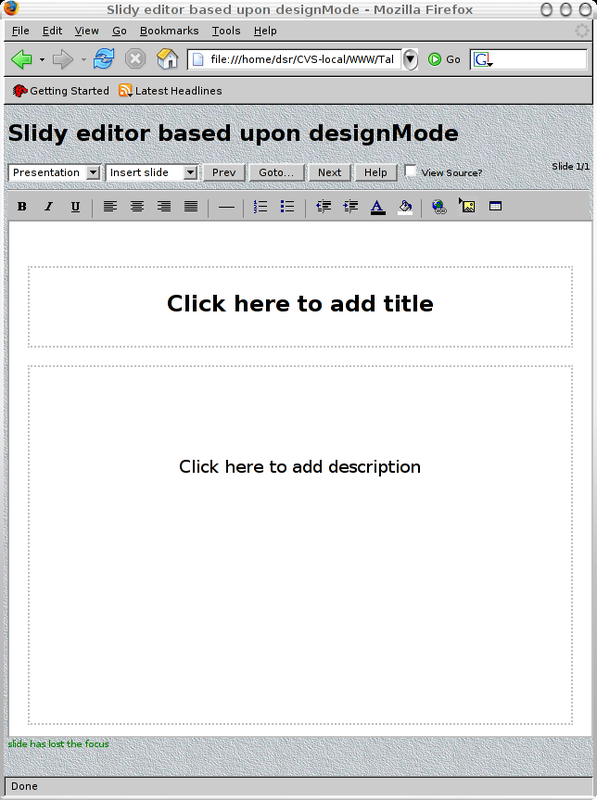 What should the Slidy editor look like? Saving a presentation without the audio is like a sandwich without the filling!